What kind of doctor can prescribe Suboxone in Fort Lauderdale? Suboxone is a medication that contains buprenorphine and naloxone. It is used to help prevent withdrawal, cravings and relapse. If you are wondering about what kind of doctor can prescribe Suboxone for an opiate problem, I am going to discuss it in this article. I would also like to discuss the cost of treatment and insurance coverage. You may be looking for a doctor who can help you with opiate and opioid addiction for the first time. Or, you may be seeing a doctor now who is very expensive or is not a good match for you and you want to know who else can write for buprenorphine. The treatment of opioid dependence is considered to be a psychiatric treatment. Because of this, many psychiatrists should be trained and prepared to give Suboxone treatment. If you are already seeing a psychiatrist, the best step to take first is to ask your psychiatrist if he or she prescribes Suboxone. However, psychiatrists are not the only doctors who can write a buprenorphine or buprenorphine with naloxone prescription. What happens in a bupe treatment program? When you first arrive at the addiction treatment clinic to get started with buprenorphine, you may already be experiencing withdrawal symptoms. In fact, they may have asked that you be in withdrawal for the appointment when you first called to schedule. Starting buprenorphine requires that you be in withdrawal first. If you are starting without having significant withdrawal symptoms you may end up suffering from precipitated withdrawal. Precipitated withdrawal is what happens if you take buprenorphine too soon after using methadone, heroin, fentanyl, oxycodone, hydrocodone or whatever opioid you are trying to quit. Basically, buprenorphine takes over the receptor and the remaining opiate or opioid in your system is displaced. While buprenorphine will partially activate the opioid receptor that it is blocking, you will still experience withdrawal sickness due to the shock of displacement of the other opiate or opioid. By waiting the appropriate time after your last opioid and waiting until you have adequate withdrawal symptoms, you can avoid precipitated withdrawal. Also, keep in mind that precipitated withdrawal is typically not dangerous. It is only uncomfortable. And, it will pass. Do not consider the treatment program with buprenorphine to be a failure if your withdrawal symptoms do not go away immediately with the starting of treatment. How does methadone maintenance differ? In a methadone clinic, you will find that there are significant differences to the typical bupe medication-assisted program. This is due to methadone being a more dangerous drug with potentially deadly side effects. However, keep in mind that methadone is still considered to be the gold standard of medication-assisted treatment (MAT). If you have problems with waiting through the withdrawal until you are ready for buprenorphine or naltrexone treatment, methadone may be the best treatment for you. It is possible to get started on methadone immediately without moderate to severe withdrawal. You will quickly enter the maintenance phase of long-term treatment. The major drawback of methadone maintenance is that you must go to the clinic every morning. While you may qualify for take-home medication after a while, it can take quite a long time to earn this privilege. Because of the serious dangers associated with methadone, this is understandable. How will I be taking Suboxone? First, your buprenorphine/naloxone may come in the form of a sublingual film or it may be a tablet. Either way, you take it the same way. The medication is placed under the tongue. Then, you wait for it to fully dissolve. While you are waiting, you must not eat, drink, smoke, talk or open your mouth for any other reason. Keep the medication under your tongue the entire time. Some addiction treatment facilities insist on watching their patients take each dose, similar to a methadone program. Others will want to watch the patient take the first dose and then let them continue at home afterwards. Watching a patient take the first dose is also known as Induction. The induction phase is a part of medication-assisted opiate addiction treatment in order to minimize the likelihood of patients suffering from withdrawal. In recent years, experts have determined that the induction phase can be completed by many patients at home, as long as the doctor is available at all times to communicate with the patient. If withdrawal does occur, the doctor should be available to comfort the patient and advise them that it is not dangerous. They simply wait for the symptoms, such as nausea, vomiting, aches and chills, to pass. After a short wait, the patient may be ready to continue. There are medications that can help to minimize withdrawal discomfort. There are detox facilities that use buprenorphine to detox patients off of opiates and opioids in a very short time. Typically, they will offer a tapering schedule for a period of one to two weeks. This means that the buprenorphine dosage will be progressively reduced each day. When you leave a detox facility, you will be off of opioids and, you will be off of buprenorphine as well. After many years of treating patients for heroin and pain pill addiction, we now know that the fast detox programs do not work very well. Unfortunately, relapse is all too common after discharge from detox. Even though you may continue with addiction therapy in an outpatient program, you may suffer from intense cravings and continued withdrawal symptoms. Because of the availability of heroin and other opiates and opioids in the current opioid crisis, overdose is a serious risk after detox. Opioid addiction experts agree that long-term maintenance with buprenorphine, or even methadone, is the best course of therapy. Additionally, naltrexone is a non-opioid medication option for long-term therapy. Unfortunately, in the current opioid epidemic, with toxic heroin poisoned with fentanyl analogs, an opioid overdose can be tragic. What exactly is naloxone and why is it in Suboxone? Naloxone is added to buprenorphine in various sublingual brands as an abuse deterrent. While there is no evidence that this naloxone deterrent has significantly prevented abuse of Suboxone or ZubSolv, it has been proven to be generally safe, except for pregnant women. Opioid addiction experts recommend that doctors write for buprenorphine with naloxone unless the patient is pregnant or has had an adverse reaction to naloxone in a sublingual medication. The naloxone abuse deterrent is included to prevent opioid abusers from injecting buprenorphine. Very importantly, if you take your sublingual film or tablet as directed, the naloxone will have no effect at all. Also important to keep in mind is that naloxone is also available as the brand Narcan. It is a powerful opioid receptor blocker. When the receptor is being stimulated by opiates or opioids during an overdose, Narcan will block the receptor, reversing the overdose and saving the life of the patient for long enough for emergency medical personnel to arrive via 911. In many states, narcan is available without a prescription. In fact, it may soon be available over-the-counter (OTC). While Narcan does cause immediate withdrawal, it is generally considered to be safe. There is a training that doctors must undergo to be authorized to prescribe buprenorphine for opioid dependency. The training takes eight hours and can be completed in one day. After it is complete, the doctor may apply for a special DEA number that must be written on every Suboxone prescription. After completing training, a doctor may treat up to thirty patients at a time with Suboxone. When the doctor has one year of experience, he or she may request an increase to be able to treat 100 patients. A new law was recently passed that allows for doctors who meet stricter criteria to apply for the right to treat 275 patients. There are multiple resources to find doctors who have obtained proper certification to write an rx for bupe. The company website maintains a doctor finder. The National Alliance of Advocates for Buprenorphine Treatment has a match program to match doctors and patients. The Substance Abuse and Mental Health Services Administration also has a physician locator. 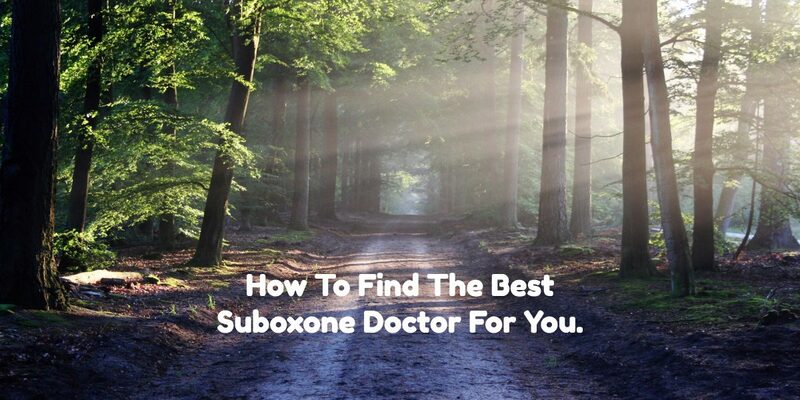 These websites make it fairly easy to find local doctors who have met the requirements to prescribe Suboxone. The problem with these listings is that many doctors who are listed have decided not to write for Suboxone and have not had their names removed from the directories. Doctors are often looking for new opportunities and are willing to sit for hours of lectures to get additional certifications. When they are faced with the real world issues of helping people out of the nightmare world of addiction to opioids, many doctors decide not to prescribe Suboxone. This is understandable. Working in a busy medical clinic can be overwhelming for a doctor. Doctors find that they don’t have the time and availability that is needed to help the opioid addict. Also, doctors, who are also human beings, can be like your family, friends and coworkers in the sense that they don’t understand addiction. Opioid addiction is not a moral failing in any way at all. It is a medical condition that requires medical treatment. It is not something that you can simply say, “just snap out of it”. Stay away from pain clinics. When you do find a doctor who prescribes Suboxone, be sure to ask if they work in a pain clinic. For some reason, many pain clinic doctors also write prescriptions for Suboxone. I recommend against going to a pain clinic for Suboxone. You will be sitting in a waiting room with patients who are waiting for opioid prescriptions. If you are trying to get opioids such as heroin and opioid meds out of your body and out of your life, a pain clinic is not a good place for you to be. Another type of clinic that is springing up in some states is the marijuana clinic. Legal marijuana must be avoided when you are getting clean. You should stay away from these pot clinics that claim to also treat addiction. Does it cost a lot to see a Suboxone prescribing doctor? How much does it cost to see a Suboxone doctor? It can be frustrating, going through the listings just to find which doctors actually provide Suboxone treatment. You may be relieved to finally find one who can see you. The next question you may have is how much it costs to see the doctor and to get the medication. Here is where things can get a little confusing. Doctors often do not accept insurance for treatment. This does not mean that your insurance company does not cover treatment. You may have to file a claim yourself for reimbursement. There may be a variety of reasons that doctors do not accept insurance directly for Suboxone treatment. Doctors in the Fort Lauderdale area charge any where from $170 to over $400 for a visit. Some include the full month of treatment and some charge for every time you walk in the door, even if they schedule you for weekly or biweekly visits. Other doctors have more complex payment schedules based on how often you come in. The medication itself is usually paid for by insurance. The issue here is something called Prior Authorization. This is a process where the doctor presents information about your treatment plan to your insurance company of attempts to get the insurance company to agree to pay for the Suboxone for a certain time period. This can be time consuming and tricky for the doctor and his staff to navigate this process successfully. There are doctors who refuse to even get involved with Prior Authorization. You can also look for discounts at the manufacturer website. Patients have told me that prices range from $6 to $10 per dose of Suboxone, depending on the pharmacy and the use of a coupon. While not cheap, this medication is worth it if it can save a life. Recently, there has been a significant change to pricing. There are now very affordable generic alternatives to the SUBOXONE Film. Some of these are close to $1 per film. So, while generics were previously only available as a sublingual tablet, you can now get the film as a generic. While looking for a doctor, it is worth it to take the time to ask some questions. How much is it going to cost per month? You will be expected to see the doctor at least monthly, possibly more often at first. If the answer about how it costs is very complex, then you may want to try calling another doctor on the list. You should be able to get a straightforward answer about monthly cost. Also ask if there are additional costs not quoted such as urine drug screens. Ask about how accessible the doctor is and how available the doctor is during the day and after hours. If you get the sense that the doctor is protected by staff and never speaks to patients outside of a brief office visit, then you may want to look elsewhere. Treating opioid dependence is different than other medical conditions. Especially early on in treatment, you may need to speak to the doctor during the day or in the evening. If you have insurance, ask about Prior Authorizations to get your insurance to pay for Suboxone. If you have insurance, ask if the doctor or his staff handles Prior Authorizations and if they are handled in a timely manner. Prior Authorizations can make the difference of hundreds of dollars in costs. A doctor who wants to avoid this minor inconvenience can cost you a lot of money at the pharmacy. If you have Medicare, ask if the doctor either accepts assignment or is opted out. If the doctor does not accept Medicare or they are not Opted Out, you may not be able to get your medications paid for. Regarding Medicare, it is important to ask this question. There are doctors who do not participate with Medicare in any form. As you can see, finding a doctor can get a little more complicated than just finding one who is willing and authorized to write the prescription. If you are trying to get more information on what kind of doctor can write prescriptions for Suboxone in Fort Lauderdale, please call Mark Leeds, D.O. for more information. Dr. Leeds charges one low monthly fee for treatment that includes urine drug screens and it includes any additional visits if needed and it covers any communications with the doctor during the day or in the evening. There are no hidden costs. Dr. Leeds also is available for direct communication. Dr. Leeds also is adept at Prior Authorizations and has obtained fast authorization for medication coverage from some of the most difficult insurance plans. So, if you are interested in starting medication-assisted treatment for opiate or opioid dependence or addiction, we are available to help you get started. This article is nice! It has a lot of great information. Thank you!